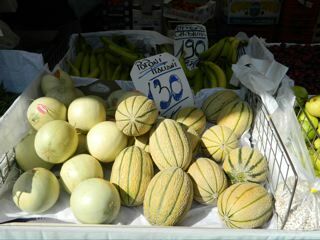 Homegrown melons picked when dead ripe are a treat not to be missed. The taste is nothing like the bland supermarket melons. Our melons are mostly heirloom varieties from Italy, and our watermelons include some varieties that were developed in the U.S. but are now widely grown in Italy. Culture. Melons like a warm, sunny space with loose, well-drained and fertile soil. Put a few shovelfulls of composted manure or good compost in the planting hole. You can either direct seed or use transplants if you are careful. If you live in zones 4 or 5, you should use transplants, started four weeks before you intend to plant them outside, but no longer than that because the plants do not like to be rootbound. Do not plant until the soil has warmed to to 65°F and night time temperatures are at least in the mid-50s, which could be up to three weeks after the last frost date. Melons and watermelons are real heat lovers and do very well when grown on black plastic mulch. If direct seeding, plant 5-6 seeds about an inch deep in an 8-inch circle. Thin to three plants. Space hills 3-4 feet apart and rows 5-6 feet apart. If using transplants, take care not to disturb the roots when transplanting. Watering. Keep well watered throughout the growing season. Good soil moisture is critical when plants are getting established and especially when the plants begin to flower and set fruits. Use mulch to conserve soil moisture, prevent weeds, and keep the fruits clean. Heirloom melons are susceptible to fungal diseases, so drip irrigation is recommended rather than overhead watering. Diseases and pests. Similar to cucumber. The biggest threat is cucumber beetles, which can be excluded by using floating row cover or insect netting. However, melons require pollination by bees in order to set fruit, so row covers must be removed as soon as the plants begin to flower. Harvest, storage and use. Judging ripeness in melons is a skill developed with experience. With watermelons, look for a yellow spot where the fruit rests on the soil and for the tendril nearest the melon to wither and die. For melons, it's a little trickier and can vary with the type of melon but in general, watch for the fruits to turn from beige to yellow and for the fruits to "slip" from the vine — that is, to be removed with just a tug. Charentais is ripe when the leaf closest to the melon turns color; the melons need to be cut from the vine, and will be overripe if you wait until you can tug them off the vine.